Determined Chesterfield bounced back from their first defeat of the season the previous week to end the unbeaten record of fellow title-chasers Streetly. 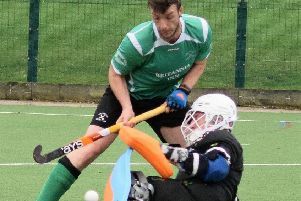 Chesterfield held their nerve to triumph 3-2 and stay third in the Midland Men’s Hockey League, Third Division table, just three points behind new leaders Telford and Wrekin. 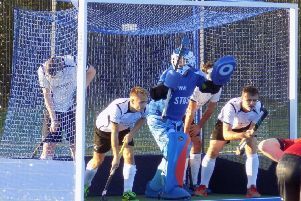 Reflecting on a job well done, captain Josh Brocklehurst said: “We wanted a response after losing to Lichfield, and we certainly got it. Energetic Chesterfield took the game to their tabletopping visitors and opened the scoring when Johnny Hancock steered the ball home after a surging run by man-of-the-match Dan Molloy. Molloy himself was next on target when his clever touch beat the ‘keeper after neat work by winger Joe Morton. And although Streetly pulled one back from a penalty corner just before half-time and then forced stopper Will Murphy into a series of fine saves, Chesterfield restored their two-goal lead in the second period. This time, the evergreen Adam Bointon rolled back the years with a cool finish over the ‘keeper from close range. Streetly gave themselves hope five minutes from time, but the hosts held on.